On this page, you will see used motorbike for sale reviews from our customers who have had real experience dealing with us. You can scroll all the way down to the bottom of this page and send us your reviews. Alternatively, you can log on TripAdvisor website and post your reviews for our business at this link. Use your Facebook or Google Plus account or just create a new account easily. In fact, they ask for reviews of tours within a year. However, you are still able to send reviews of your tours that started earlier by selecting date any of the dropping down 12 months. Also, you don’t need to go into details of your tours or number of days you rode with us, just general reviews. Please keep it short and clear, less than 10 sentences is best. In reality, we don’t trade touring motorbikes (sell & buy back options). 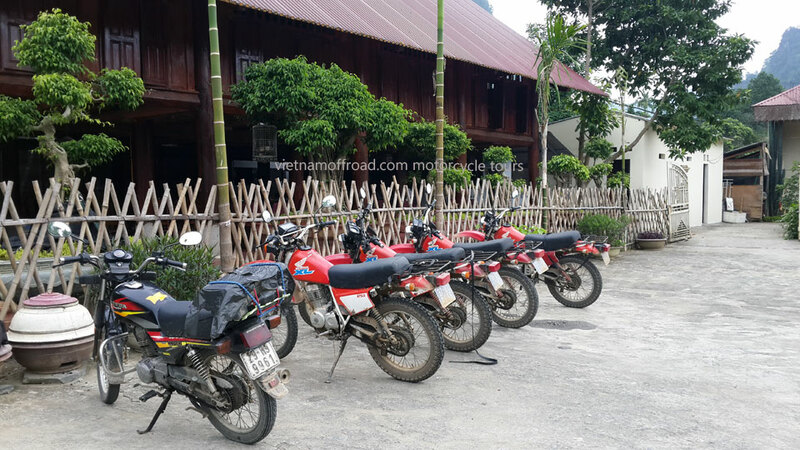 In general, our main business activities are off-road motorbike tours and rentals. The motorbikes we have for sale are our own bikes that we don’t need. The reason is the upgrade of our fleets to the newer, bigger or better ones. It doesn’t mean that bikes for sale are not good. We service them and check carefully to make sure they last for your journey in Vietnam or even into other countries (more services needed on the roads). – Mr. Guy Gillespie from Australia. – Ms. Flora Le from Canada. Hi. What bikes do you have for sale at the moment? You can buy the below bikes at the links provided. All are Japanese Honda products, no Chinese copy. 2013 – 2015 Honda XR 150cc manual dirt bikes. 2013 – 2015 Honda Wave/Blade/Super Dream 110cc semi-automatic scooters. 2016 – 2017 Honda Winner 150cc fully manual scooters. Let us know your thoughts or any detail you might need. Hello Lewis. Sadly, we have only one office in Hanoi. If you trust us, pay the bike (2,000 – 2,500$US depending on conditions) and 100$US shipping then we can send a bike down there. $100 to ship it from Hanoi to HCMC?! Dude, that costs $40. It depends on capacity, for example under 110cc is just more than half price of 150cc. If you want foam protection or wooden box it costs more. Go to any train station and get a quotation, don’t be a keyboard hero! I’m looking to buy 2 dirt bikes for around $300-400 USD. Do you have anything? Thank you. Hello Alex. 99% of used motorbikes for sale in Vietnam to tourists is Chinese copy. We NEVER use a Chinese copy. Sadly for the price you mentioned you can only buy a very old of Chinese copy which is likely to break down everyday. A new Chinese Win 100-110cc costs about 600$US each. Vietnam charges 120% taxes for imported bikes from 125cc so a new Honda XR125 is about 2,800$US while a new CRF250L costs about 10,000$US. Crazy prices? That’s what we pay in Vietnam! So there is nothing we could do for you this time. Good luck. I am looking to buy a bike. Preferabley honda xr 650 or xr 400. Do you know any for sale? Or where to buy a new one from ? Hello Mike. Vietnam charges 120% taxes on imported bikes from 125cc. Dirt bikes have not been made in Vietnam and for a new XR400 you pay around 18,000$US (new) and expect from 20,000$US for a new XR650. You have to order from shops, they don’t have any in stock. The cheapest CRF250L goes for 10,500$US. Many people wanted big bikes but after they knew the prices most would never thought about this again. We still have to use the older XR250’s due to taxes. Hello Johan. Unfortunately, 99% of the “Honda Win” is in fact Chinese copies. Check the blue registration card and look at the engine. If you can’t find Honda printed on the card or the engine comes with both kick-start and electric start then it’s a Chinese fake. We care about customers’ safety, satisfactory and performance and never use a Chinese bike. Therefore we can’t assist this time. If your budget allows, buy one of our Honda XR250 as seen on this page and you will have a good time, the cost is from 1,500$US. I am looking for a second hand used Suzuki DRZ 400, do you sale any one or you know where to buy? Hello Martin. Unfortunately we only work with Honda motorbikes and currently know nobody who has a bike as you requested for sale. A new bike would costs around 15,000$US with taxes included and most of used bikes are illegally imported into Vietnam. This means you have to accept the confiscation of the bike if the police pulls over. Normally a decent used one costs between 4,000 – 6,000$US range. Good luck with your research. I have booked a holiday to travel to Vietnam in January of 2015, and I was wondering if you sold any legally powered touring/dirt bikes (e.g. Honda XL range) and how much they would approximately cost. Hello James. Sadly, we have no manual touring motorbike for sale at the moment. There are many shops that deal with cheap Chinese copies but they are really unsafe noisy metal pieces. We don’t like Chinese bikes. However, you could buy the new XR125 for around 2,800$US brand-new. Alternatively, you can hire a Honda dirt bike from us, 25$US/day for XR125 or 35$US/day XR250. Please let us know if we can assist you in any other way. Hello Peter. Unfortunately, we have no Honda XR250 for sale at the moment, but maybe in early 2015 when we upgrade our current bike fleet. Due to taxes, an used Honda XR250 costs from 2,500 to 3,300$US with papers. Are this price what you expected to spend? Hi I currently live in Ha Noi and im trying to track down a Honda GL to buy Do you think you can help in any way? Hello Jake. Unfortunately, we sold all Honda GL series last year so we have no bike available now. In addition, we don’t buy and sell used bikes, just sell what we don’t need to upgrade to newer or better fleet. Most of GL series are quite old now and you do need to know mechanic basics in order to have a great trip. Good luck with your research. I am looking to purchase an XL250 or 400cc bike. I am about 2m tall, 6’7″ and about 265 lbs. I need a taller bike that has enough power to carry up the hills at a decent speed. Let me know if you have anything available. Hello Craig. At the moment we have no manual clutch bike for sale. We only sell our bike(s) when we upgrade our bike fleet. We don’t buy and sell bikes. Good luck.